After the first week of programming that was put together post-WrestleMania, I thought for sure that nothing was going to change with these people, their creative direction, or the quality of the production television. I was pretty much convinced that they no longer cared about anything more than money and their corporate image. It was also wildly obvious that the WWE had most likely pushed to the back-burner the notion and desire of genuinely pleasing the fans while constantly striving to gain new ones. To be perfectly honest, I was getting extremely tired of writing articles about how much the WWE had been stinking it up as they were apparently becoming a more convoluted shell of what they once were. I’m very pleased that the WWE has seemingly woken up from their slumber and quite possibly have begun clearing the cobwebs. The WWE is turning the tides. This past week they treated us all to episodes of RAW and SmackDown that had more good qualities than not. There was actually a nostalgic feeling of what it was like to watch this stuff during the late 1990’s when it was almost always awesome. Where the WWE had been floundering and missing the beat, so to speak, with a lack of continuity from show to show and a lack of that almost palpable level of excitement and passion that professional wrestling is so dependent upon—this week they flipped a switch and delivered, period. There are many areas in need of improvements and some began to be addressed this past Monday on RAW. I feel that the key word there is improvement because one month ago I was definitely convinced that they no longer had even the slightest desire to improve their product for real like they had to do in the mid-nineties when WCW was taking over. The key in life is constantly striving to improve whether you’re a single person, on a team, or running a business it is best for anything anytime to always make improvements. To become complacent and content can easily be the death of any successful business and the WWE certainly is no exception. It was even more pleasing to see that same trend continued on SmackDown. It was not the average Thursday night show that we see on weekly basis and become aggravated because it’s not usually a continuation from where RAW left off however, this week felt new and fresh. This episode seemed to have continued right in line from RAW with no hiccups or shortcuts. It really wasn’t a card that was just thrown together at the last-minute because the show had to be booked, which is what most SmackDown tapes have consisted of for as long as I can remember. Thursday’s show had structure and content that was very well-developed and made sense from where RAW went off the air, which is how it should ALWAYS be! It almost feels like Christmas may have come early or something because the WWE actually put on two very solid shows in a row. I hope these types of efforts will be shelled out on a regular and consistent basis in the future. After watching both RAW and SmackDown this past week, I noticed many things that were done differently and much better than what we’ve been accustomed to lately. Many of these observations are actually apart of the vast array of fundamentals in professional wrestling that the WWE has just flat-out neglected and removed from the majority of their shows. Some of the other points of improvement that I noticed were based on things that were executed correctly to build excitement and anticipation for future events. Many things were done that were out of character for the company and even some chances were taken but, as a result, we received two great programs back-to-back. Let’s not be mistaken, getting two awesome shows in a row from the WWE has been like a miracle waiting to happen for the longest time, and it finally did. In this article, I will individually cover the specific reasons that these shows were greater than normal, and the exact instances that contributed to their greatness. Starting a tag team tournament on RAW was a great decision. With the exception of The New Day, this division has looked very weak and became almost non-existent. There was very little focus that was put on the majority of the teams and that only took focus away from the legacy and prestige of the WWE Tag Team Championship. To understand the legitimacy of this claim, just look back to a few short weeks ago when the tag titles weren’t even defended at WrestleMania, the biggest show of the year, and to me that is the most telling proof of this neglect. The tag team division has always been one of the best and most exciting in pro wrestling and it’s been a crying shame having to watch only one team (The New Day) have any type of prominence or relevance in the promotion—all fault is on the WWE for that. In the past, the tag team championship had always almost been on the same level as the WWE world championship; thanks to teams like the Fabulous Freebirds, Hart Foundation, Legion of Doom, Demolition, and The Dudley Boyz to name just a few from history. This tournament adds some relevance to the division and shines a much-needed light upon it. We will see much fiercer tag team spectacles and many of these guys will get their much deserved spots on the show. We are also seeing the emergence of new tag teams that will absolutely make an impact that’s just too huge to be ignored. The attention of the fans is now sternly focused on the tag team division. The WWE has done a great job with this tournament and building up the teams involved, as well as weaving in great story-lines and spinning off feuds from it—awesome job! It’s no secret that it’s been increasingly difficult for the WWE to rebound from an injury plagued roster over the last few months. They have done a great job starting to gradually incorporate new acts from NXT onto the main roster. Guys like Sami Zayn, Baron Corbin, and Apollo Crews are all overflowing with mass amounts of talent that should take them very far on the flagship shows. So far, every one of these dudes have been booked the correct way to build their characters, their legitimacy, and get them over with fans. Another thing is seeing an ace like AJ Styles already moving up into the number one contender’s spot for the crown, which is such an intelligent and superb decision it’s hard for me to even find the words to describe it. “The Phenomenal One” is pound-for-pound one of the very best wrestlers on the planet bar none and it would be tough for someone to argue anything otherwise; you may not particularly like the guy or his act, but you cannot deny his skills. He deserves that spot and they rightfully awarded him with it. I have no doubts that he will make the most of this opportunity, win or lose. I can’t say enough great things about new teams like Enzo Amore & Colin Cassady or The Vaudevillains—these are two real-deal duos that are going to absolutely light up the scene. 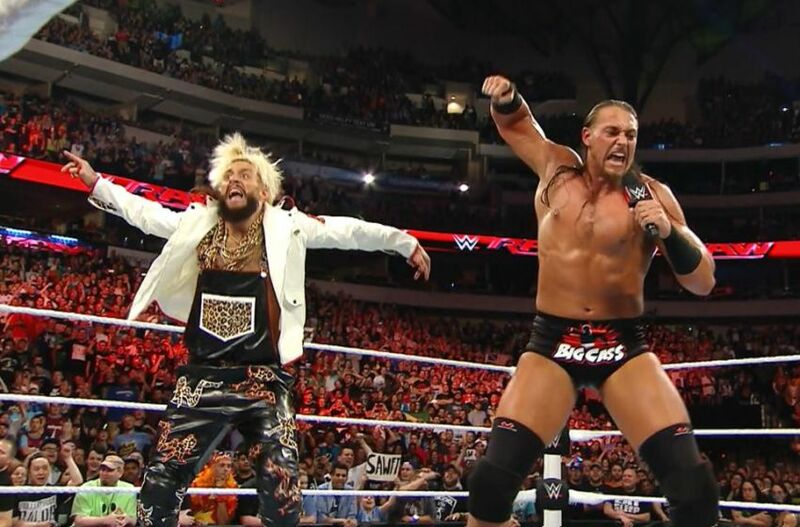 Enzo & Cass are literally like already over with the fans after just one week on television, and much of that can be credited to how over they were in NXT. This is a special type of team that only comes around every once in a while; two guys that are just oozing charisma and each have the much-loved “it factor,” they are a rare breed. That’s not to take anything away from The Vaudevillains who are also amazing performers, but their act will definitely take much longer to get over with the fans because it is just so different. What is great about these guys is how well they have their characters and gimmick down to a science. The gimmick is just incorporated into everything that they do–from the way they look and move, to the way that they walk and talk, and even the way that they work in the ring, which is proof that these men have a great chemistry together, and great chemistry makes great teams. This pair from the roaring twenties will undoubtedly move up the tag team ranks with authority. For the most part all of these new acts have been brought up the right way and are adding much-needed depth to the roster. We all needed to see some fresh faces on these shows and wanted to see the paradigm shift of the WWE, and it feels like we may have finally gotten exactly that. This week, almost every match on both Raw and SmackDown had something on the line or some real significance to it. When all of the matches have some real meaning attached to them and are the culmination of a great story, that is when professional wrestling is at its best. When the Kevin Owens’ & Sami Zayn rivalry gets more intense and explosive with every show; that is best for business. When the WWE sets up a tag team tournament and The Usos win their match, only to be ambushed by two relatively unknown men like Karl Anderson & Luke Gallows from out of nowhere; that is best for business. When AJ Styles wins two different spectacular matches to remove all doubt that he is the true number one contender for the WWE World Heavyweight Championship; that is best for business. These are all little things that have to stay in constant order to keep the shows great. All of these elements have been building themselves rapidly and that has given everything a new dynamic. The WWE has recently stepped up their game in the creative department, and probably some other things too because we’ve been getting a much better, more enjoyable product since WrestleMania. Now if someone should just ask them not to lose their concentration. There’s no question that these past few weeks were some of the best that the WWE has had in a very long time. Tonight starts a new week and all the more reason to keep up the progressive approach. If they can’t figure out how to capitalize on this recent surge, then they’re totally lost their touch. The momentum is on their side and they need to move forward and ride it out. Embrace these positive changes and keep turning the tides.